Rafael Soriano started his professional life as an outfielder, but the Mariners soon turned him into a pitcher, Baseball America wrote in 2001. Helping him with the transition was his pitching coach at AA San Antonio Steve Peck, the magazine wrote. "He's still learning to pitch but he's learning fast," Peck told Baseball America of the hurler who is going into his 14th major league season in 2015. "He has more than enough stuff to get batters out, and as he learns to use it more effectively he's going to present a problem to hitters at any level." Peck has been working to evaluate talent as a coach and as a scout since his own eight-season professional career. Peck the player made it as high as AAA. He never made the majors. 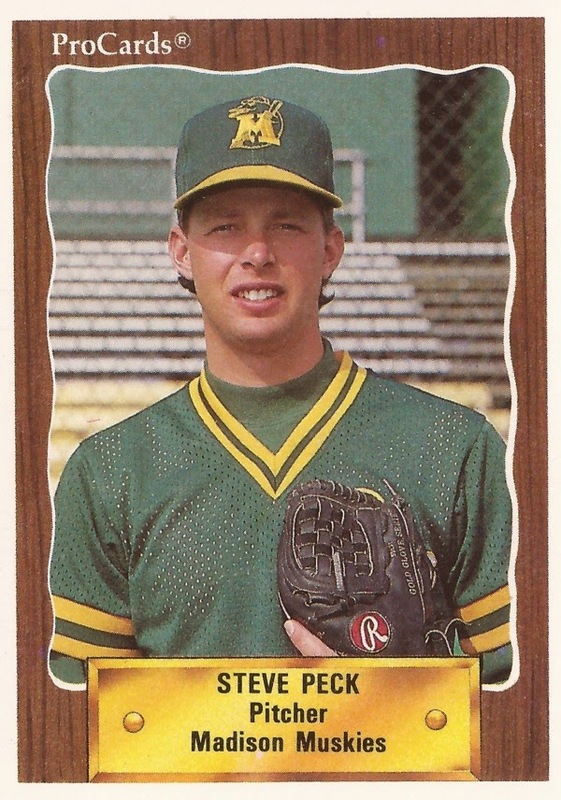 Peck's career in baseball began in 1988, taken by the Athletics in the 43rd round of the draft out of Mesa Community College in Arizona. Peck spent his first two seasons in the rookie Arizona League. He got into six games his first year there and 12 his second. He played 1990 between single-A Madison and high-A Modesto. He went 6-4 between them, with a 4.44 ERA over 35 outings. For 1991, Peck moved to the Angels and high-A Palm Springs. He then played 1992 at AA Midland, going 8-6, with a 3.96 ERA in 43 outings, seven starts. Peck made AAA for all of 1993. He had a 4.85 ERA over 31 outings. He didn't make Anaheim. Peck played 1994 at AA El Paso with the Brewers and 1995 at independent Tyler, ending his playing career. By 1998, Peck was a coach in the minors, serving as pitching coach at single-A Wisconsin. He was at AA New Haven in 2000. By 2003, Peck had a new role as a scout with the Mariners. He's since moved to the Red Sox, serving as a special assignment scout in 2015.